Offline-first is a concept that allows developers to assume that some of our application users do not have access to the latest device and the fastest internet connections. With this in mind, applications can be built and progressively enhanced to take advantage of network connectivity when available. With offline-first, users can still interact with your app even when there is no reliable connection available. Fortunately, there are variety of tools available for developers to build a progressive web apps for users. In this tutorial, I want to introduce you to StencilJs; a relatively new tool built by the Ionic Framework Team. It allows to build fast web applications using web components. Not sure of what web components are? Relax, we will discuss that later in this article. The benefits to developers include generating custom components and speed-boosting in terms of rendering/execution times. Progressive Web Apps describe a collection of technologies, design concepts, and Web APIs that work in order to provide an app-like experience for application users on the mobile web. Web components are a set of reusable user interface widgets. This offers you the flexibility of reusing your code and logic again with a custom html tag. To explore more about the details of web components, kindly visit the link. Implementing data-binding through binding state variables to onChange events allowing those states to be changed as the input values change. Before we dive into code and get started with StencilJs, let’s take a quick look at what we will be building together in this tutorial. It is not a complex project. Although as simple as it looks, it thus provides a nice introduction to working with Stencil, and a brief introduction with a practical approach to building an offline first progressive web application. I assume you already have Node and NPM installed. If not, quickly follow the link and install them on your system. The command above will clone the repository into a folder called stencil-pwa-app. Obviously, this will be the name of our project, but please feel free to edit and name it as preferred. To continue the development of our application, we will be using some additional features of Stencil like Events, Dynamic Content and State Management. 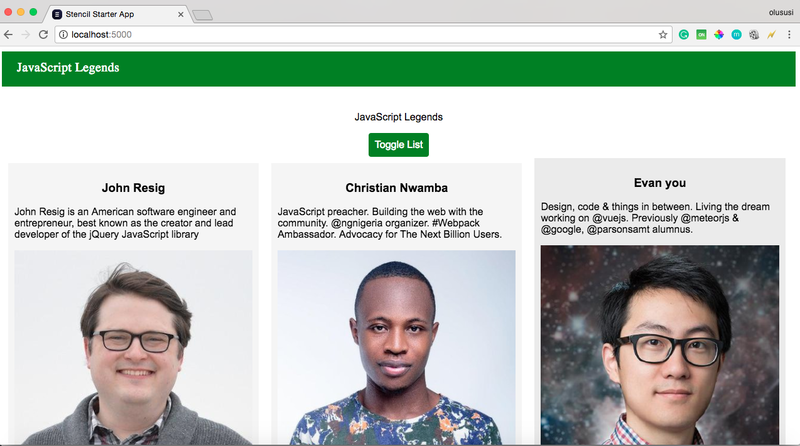 As mentioned earlier in this article, we will be building a very simple application using Web Component. Now that we are familiar with basics, we will create our own custom web component. 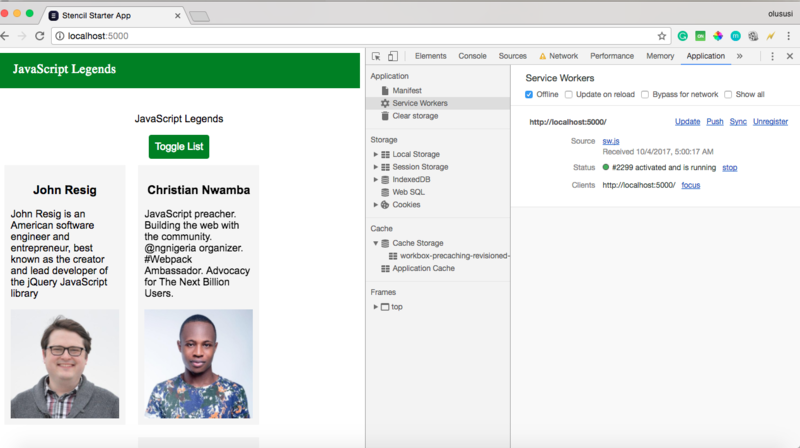 In our existing cloned project, create a new directory within stencil-pwa-app/src/components called my-legend. This will house all our component logic and styling. Then add two new files within the directory you just created my-legend.tsx and my-legend.scss. Component: As mentioned earlier, it provides and declares component metadata. State: This decorator monitors the changes within the component using the toggle property and determines whether or not the content should be visible. We also declare an array that contains the list we intend to display within our application. Our application will display the list from the array declared above whenever a user clicks on the button to toggle the list. This button can make the list either visible or hidden. To accomplish communicating and handling these events, our application needs to listen and be able to carry out the appropriate action. That is why we declare a method toggleComponent() from above. From the file above, you will realize that we also added a stylesheet style.css which was used to style the navigation bar. Part of the main objective of this article is to make our Stencil application progressive. Fortunately, Stencil is built with support for service workers out of the box. Service Workers is a very powerful API that powers progressive web apps. This command will prepare our application for production by adding built files into stencil-pwa-app\www folder. More importantly, it will generate a service worker and inject the necessary code to register the service worker into our index.html file. This will launch our application on localhost port 5000. 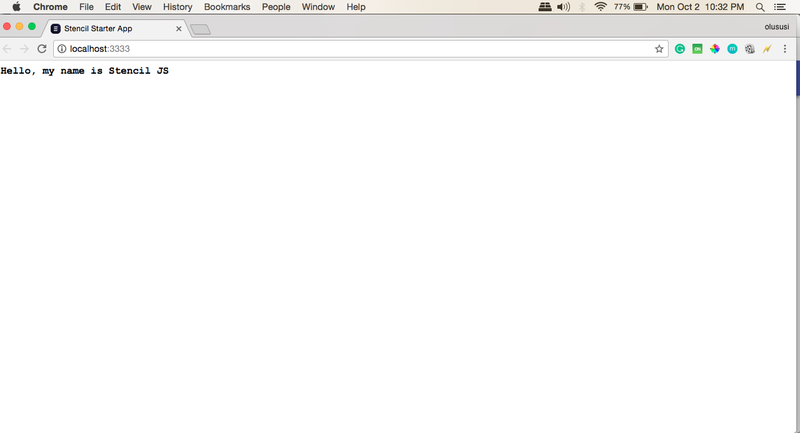 If we navigate to localhost:5000, we should still see the page running as before. To inspect our configured service worker, open the developer tool on Chrome and click the Application tab. Now select service workers — you should see a registered service worker. This application can be run offline without any fear of fast internet connection. You can clone the demo and see it work on your machine. Building web applications with web components and the ability to share this component, irrespective of the frameworks used, will transform how we build web positively. You might have realized that it is easy to quickly build an offline first progressive web application with StencilJs. Even though Stencil is still in the early stage of development, moving forward, it will definitely make working with web component easy.